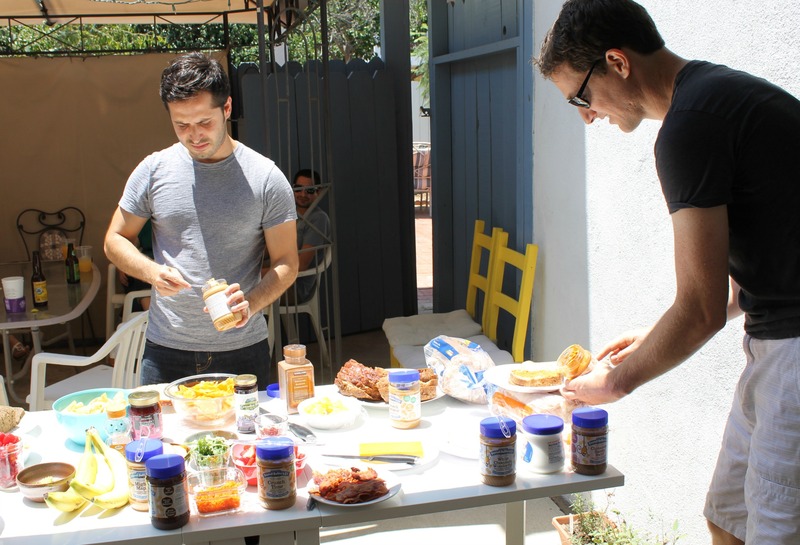 PB Throwdown with Peanut Butter and Co.
A few years back when I lived in Los Angeles, a few friends and I had a sandwich day (30 Rock anyone?) which consisted of us making the most epic sandwich creation ever and then sharing amongst the group. So when Karla from Foodologie and I started chatting with Peanut Butter and Co., we decided that we would host a party dedicated to one of the most beloved sandwiches in the US – the peanut butter sandwich. But this wouldn’t be any ordinary party, it would be a PB throwdown with Peanut Butter and Co.
Peanut Butter and Co. was generous enough to sponsor our PB throwdown event and sent us multiple jars of each of their flavors: Smooth Operator, The Bees Knees, Cinnamon Raisin Swirl, White Chocolate Wonderful, Dark Chocolate Dreams, Crunch Time, The Heat Is On and Mighty Maple. With our peanut butter lineup secured, Karla and I gathered the remaining items that were needed for our showdown including various toppings, bread, fruit, spreads, cheese and of course bacon. 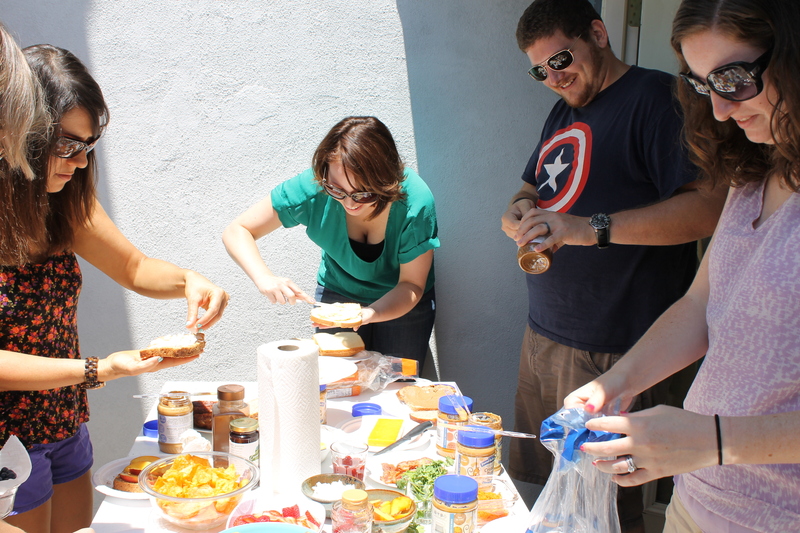 With our spread complete, it was time to start the PB throwdown. We decided to keep the rules simple. Just build the most creative sandwich you can, as long as it included one of the Peanut Butter and Co. flavors. The entire group would taste each sandwich and then cast their vote, with the winner receiving 8 Peanut Butter and Co. jars! We had a very enthusiastic group of sandwich makers that quickly got to work. And thanks to the wide range of flavors that Peanut Butter and Co. has to offer, we saw a wide variety of sandwiches. 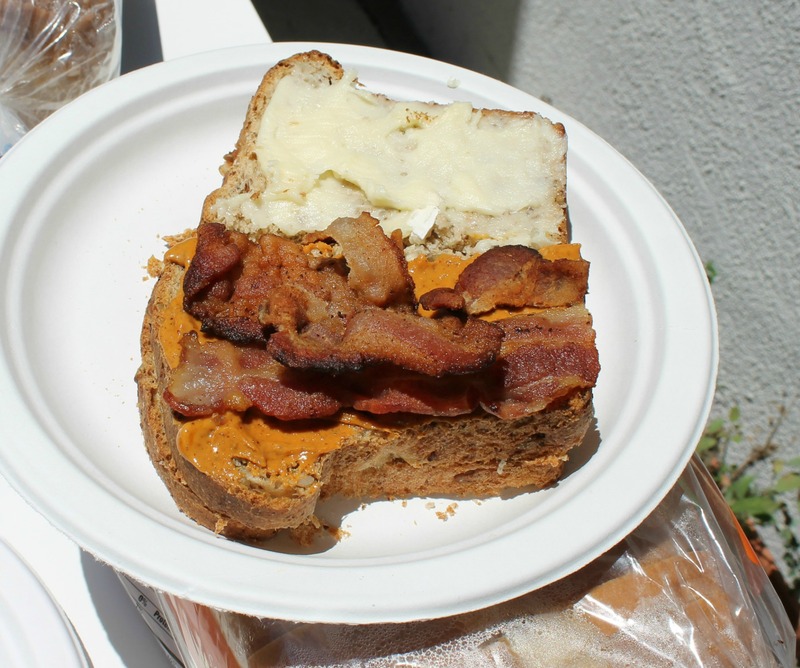 One sandwich entry included brie, bacon, The Heat is On peanut butter and pickles. Another one featured Dark Chocolate Dreams, strawberries, blueberries and raspberries. 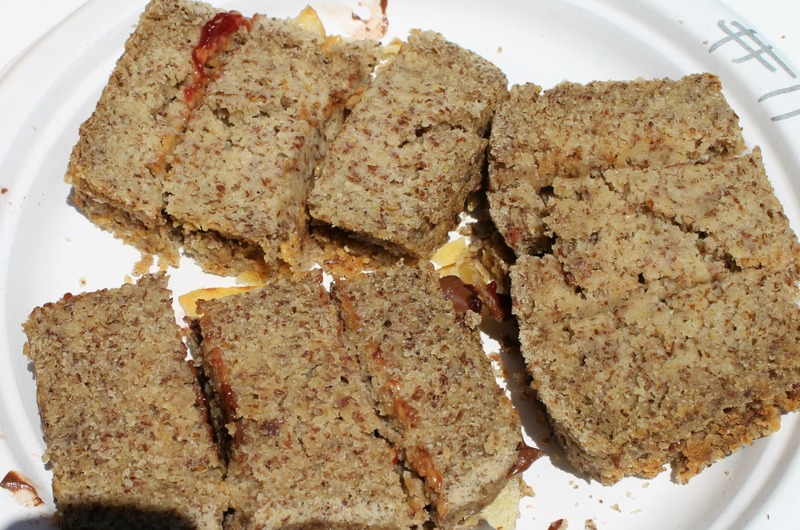 The best gluten-free bread ever made an appearance for a potato chip, Crunch Time and raspberry jam sandwich. Some participants took their campaign for best sandwich very seriously (spoiler alert: she won!). 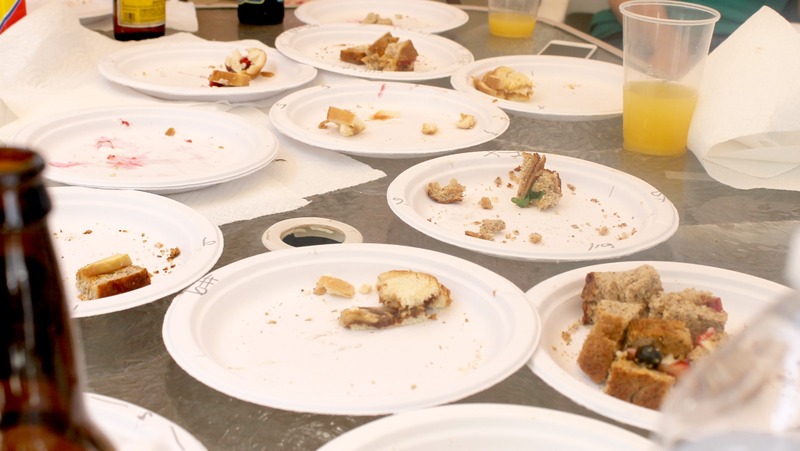 After the tasting (12 sandwiches in total) all the plates were empty, because all of the sandwiches were so delicious that people kept coming back for seconds! And my lovely friend Vanessa went home with the prize (all 8 flavors of Peanut Butter and Co.). 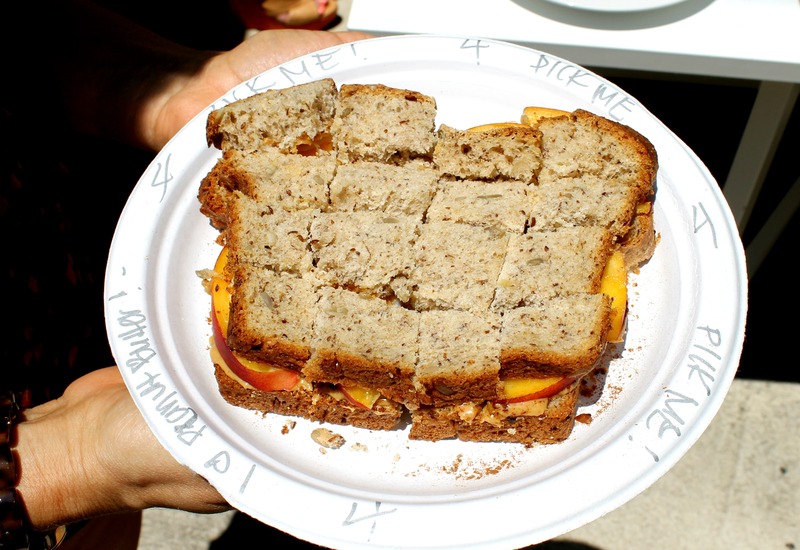 Her winning sandwich contained White Chocolate Dreams peanut butter, nectarine, cinnamon and shredded coconut. No PB throwdown is complete without some dessert, so Karla whipped up a Spicy Peanut Butter Pie using The Heat is On, and a Honey PB Pie featuring The Bees Knees. And since pie and ice cream go hand in hand, we had some of that too. Chocolate Sorbet, Maple, and White Chocolate Dreams ice cream flavors were the star of the show. 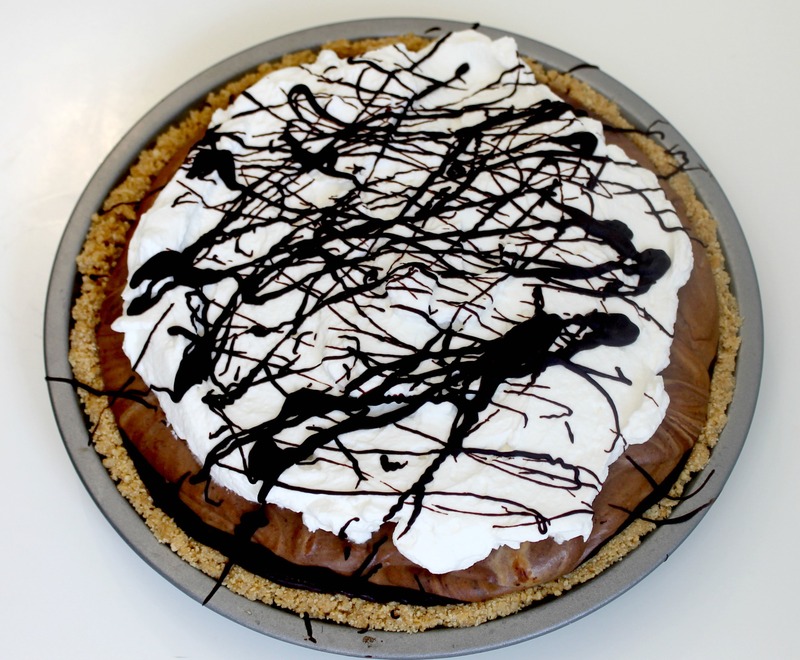 Karla is seriously a pie and ice cream making extraordinaire, so be sure to check out her blog for the recipes. When all was said and done, everyone ended up going home with a peanut butter flavor of their choice which I think is the best parting gift anyone could ask for. And I’m proud to say that my pantry is now stocked with a variety of Peanut Butter and Co. flavors. A HUGE thank you for Peanut Butter and Co. for providing the peanut butter and making this PB throwdown possible. And another big thanks to Karla for opening up her home and hosting the party. So now here’s the fun part. 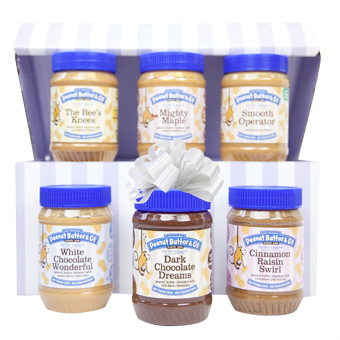 One lucky person will win a sampler pack featuring 6 of Peanut Butter and Co.’s flavors! That’s 6 jars of delicious peanut butter goodness. Enter to Win Below or Leave a comment below sharing what flavor you want to try and want kind of sandwich you would make. Good Luck! Giveaway ends on Tuesday, July 30th at 12AM PT. 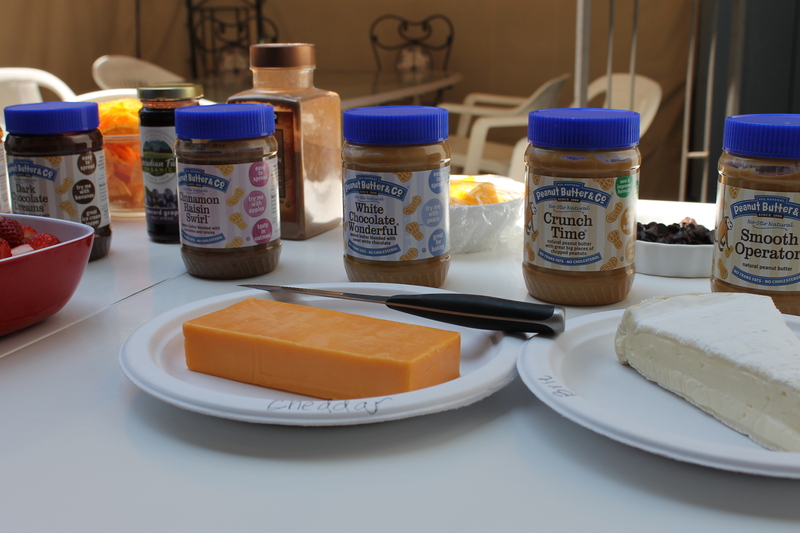 This entry was posted in Food Bloggers, Giveaway, Life and tagged pb throwdown, peanut butter and co on July 16, 2013 by allie@sweetpotatobites. Ahh this looks so fun!! Good job guys! Sorry I missed it :(( Deff sharing! thanks for sharing! can’t wait for the next time we all get together and cook something delicious 🙂 gnocchi? authentic Hawaiian food? Love it!! We need to do it again!! I am partial to cinnamon raisin swirl! Also, this looks like my favourite party theme ever. I’d love to try the cinnamon raisin swirl PB…in a PB & banana sandwich! I’d be all over the bees knees – combined w the chocolate flavor. pb on pb! pb on pb is the best! the chocolate flavor is pretty amazing. I would love to try the spicy one on white bread!!! I would love the white chocolate dream flavor – I want to try it with sautéed bananas, cinnamon and a few dark chocolate chips! I’ve never tried this brand before….would love to try the chocolate and would make a chocolate PB and jelly sandwich. I would love to try the cinnamon raisin, it sounds really interesting..
Looks like fun! I have to say I am a big fan of Mighty Maple, but have not tried any other flavors yet! Excited to find a new food blog to fallow. All the peanut butters look so good it’s hard to pick just one. Oh and I would make a Mighty Maple peanut butter sandwich with bacon and bananas. ok now that just sounds amazing! the maple/pb/bacon combo is really good. I have plenty of experience with I <3 peanut butter. My son in the Marine Corps loves White Chocolate Wonderful and Dark Chocolate Dreams. I send him the snack packs of The Bee's Knee's and Dark Chocolate Dreams. On occasion he's even been known to share it. I could imagine his face if he were to get a six pack in the mail. I’d make Smooth Operator Dates Seriously Strawberry Sandwich! – Smooth Operator with Dates, Strawberries and Seriously Strawberry Jam! White Chocolate Wonderful is the only one I can find near me, and I love making sandwiches with it and blackberry jam! I’ve been dying to try The Bee’s Knees though. White Chocolate spread over freshly sliced juicy peaches with a dash of cinnamon on cinnamon raisin bread toast! Yum! Thanks for sharing! I want the white choc melted over a poached pear…. I would love to try The Bees Knees with banana and marshmallow fluff! I’m a big fan of the cinnamon raisin swirl. I make waffles sandwiches with fruit — 1 waffle cut in two with a tbsp of the cinnamon raison swirl plus strawberries and blueberries. YUM! That Mighty Maple looks REALLY good…. I love white chocolate wonderful in a apple and PB sandwich! Cinnamon Raisin Swirl, figs, laughing cow cheese wedge. Mmm. I love Crunch Time spread with raspberries and organic medjool dates! My fave flavor is Mighty Maple. I like to make pb and banana sandwiches with it. Dark Chocolate Dreams…with marshmallow cream!!! I really love the cinnamon raisin. I think a banana, cinnamon raisin, and honey sandwich would be delightful! My favorite is the cinnamon raisin, especially made for a PB and banana sandwich! Would love to try tyhe Mighty Maple with the Dark Chocolate Dream. A desert sammie: Dark Chocolate Dreams and crushed oreo cookies! I’d love to try The Bee’s Knees with bananas and chocolate chips! I love the Dark Chocolate Dreams. Not only on sandwiches but on toast for breakfast! I am not a fan of sandwiches but I love the cinnamon peanut butter on ritz crackers with a few chocolate chips. I love the Peanut Butter and chocolate. The Dark Chocolate Dreams, strawberries, blueberries and raspberries sounds so good. I would love to try White Chocolate Wonderful! I would make my favorite sandwich using Mighty Maple PB. Toasted bread, PB, Jelly, mustard and parmesan cheese. Dark Chocolate Dreams, come to me please!! I would put that in a sandwich with marshmallows and maybe some graham crackers or use those as the bread!! White Chocolate Wonderful is the best! I enjoy it simply with blackberry jam. I love, love, love this peanut butter. I can taste the white chocolate right now with a big dollop of homemade blackberry jam!! Thanks for the opportunity! White chocolate wonderful with bananas on whole wheat bread. My favorite flavor is White Chocolate Wonderful! I’m embarrassed to admit this…but, I’ve never considered using it on a sandwich–I eat it straight out of the jar! I love Peanut Butter & Co! Thanks for the giveaway. I would love to try the White Chocolate Wonderful. This PB making sandwich party sounds like so much fun, that I so believe I will need to throw one for my friends, too!!! I am OBSESSED with the White Chocolate!!! Love it straight out of the jar or drizzled over a piece of toast with bananas! YUM! Love PB & Co!!! Hope I win! I like White Chocolate Wonderful with pears. I would love to win, and try the different flavors. Then I will share my favorite! Thanks for hosting this giveaway! Dark Chocolate Dreams is MY LIFE. I make little apple or peanut butter sandwiches with this. Would love to try the other flavors, but I am not sure I could cheat on Dark Chocolate dreams like that. My favorite flavor is White Chocolate Wonderful! The sandwich I would make would be a white chocolate wonderful and dark chocolate dreams with banana slices on wheat. Yum! Cinnamon Raisin Swirl! I would use that flavor to make a PB + Banana sandwich! I would make dark chocolate dreams with banana. yum! I have never tried this amazing brand but am going to even if I don’t win this contest 🙂 I love the cheese and PB sandwich the most…wacky but so good! Right now I LOVE raspberries and nectarines. I think I might have to try the Dark Chocolate Dream (because you can never go wrong with that) and fruit slices with a little honey wheat bread. Is it lunch time yet? Dark chocolate dreams is my favorite. 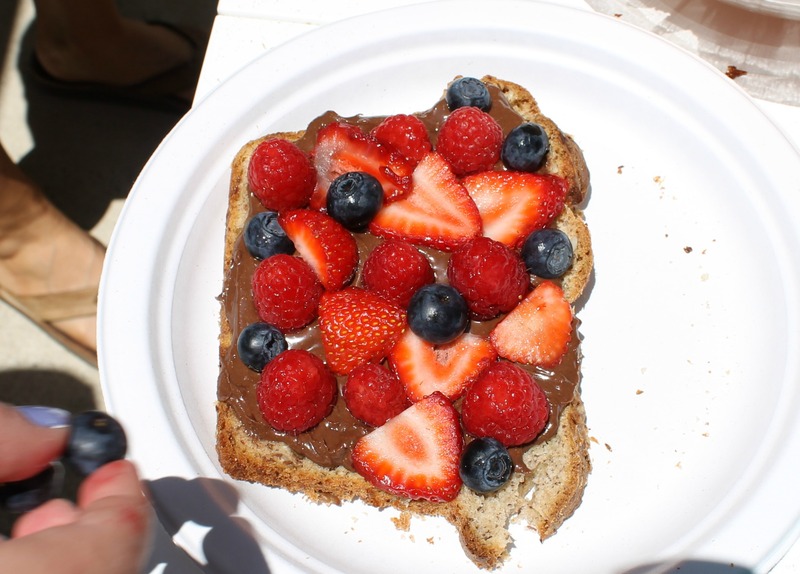 A great sandwich is dark chocolate dreams with fresh strawberries on whole wheat bread! Such a stellar idea! I’m obsessed with Dark Chocolate Dreams, and now am dying to try the other flavors! Mighty Maple for a pb & bacon sandwich! I am obsessed with Cinnamon Raisin Swirl, and I think it goes best with sliced bananas on a whole grain-flax wrap! cinnamon raisin swirl in a sandwich with honey! Alli B. won the giveaway and has a pack of PB headed her way. Thanks to all who participated!